When a mass transit agency for a large metropolitan area needed to streamline its data backup, it turned to STORServer to implement a simplified yet effective solution. This innovative agency decided to take advantage of the newest IBM® Spectrum Protect™ features, and soon realized a search for a new backup solution needed to take place. Its existing mainframe was unable to handle the resource requirements for the newer version of IBM Spectrum Protect, thus necessitating a refresh of its existing data backup solution. The agency was running two instances of an older version of IBM Spectrum Protect, formerly IBM® Tivoli® Storage Manager (TSM) Version 5.5, in a Linux environment on a partitioned IBM® mainframe computer, the IBM System z9™. To partition the OS, the agency used the IBM® z/VM® operating system. The IBM Spectrum Protect data protection platform was connected to an IBM® 3494 Tape Library with a mix of IBM-3590, IBM-3592 and IBM-TS1120 drives. The backups were first sent to a small disk pool subsystem and then to tape for both onsite and offsite copies. Another objective for the agency was to reduce the current server environment into a smaller, more easily manageable implementation. Moving from a tape-based backup to a disk-based solution meant its backup and recovery times would become exponentially faster. Streamlining its data backup systems could save its staff members valuable time and allow them to focus on other critical projects. STORServer helped this large mass transit agency implement a new backup solution at its primary IT location and secondary site across the river, which serves as its disaster recovery location. Both sites contain the same appliance configuration consisting of one STORServer EBA2802 backup appliance and one IBM TS3200 LT07 tape library. Each tape library is attached to the EBA2802 appliance on site. In addition to having a complete copy of their data on disk, another copy is written to tape at each site. These serve as the third and fourth disaster recovery copy. These tape copies will be available should the agency be unable to restore from the disk storage attached to either the primary appliance or the disaster recovery appliance. With the primary backup and disaster recovery copies residing on disk storage and another full copy sent to each library, the agency has four levels of redundant protection. With a few simple mouse clicks, the tape libraries are also able to be used as an archive target for specific point-in-time copies at no additional cost. Primary Site: STORServer EBA2802 and IBM TS3200 LT07 – The STORServer EBA2802 enterprise backup appliance with internal SSDs and 240TB of attached disk storage allows the agency to leverage the deduplication features now available in IBM Spectrum Protect. The new setup enables deduplication for primary backup storage pools and keeps the deduplicated data on disk storage instead of migrating to tape media. For this implementation, select data was identified and migrated from the agency’s legacy IBM Spectrum Protect Linux environment to the new STORServer appliances. The IBM TS3200 LT07 is a four-drive, 48-slot tape library used for archive and disaster recovery copy purposes. The tape library leverages the latest generation of LTO technology to help cost-effectively handle growing storage requirements. The TS3200 and its storage management applications are designed to address capacity, performance, data protection, reliability and affordability. STORServer also set up an archive pool on the tape library, separate from the disaster recovery copy, that automatically migrates selected snapshots of data for low cost long term storage. In a scenario where the primary appliance disk copy is compromised and the network link to the secondary STORServer appliance at the disaster recovery site is inaccessible, the IBM TS3200 LT07 tape library will have a full copy of the agency’s data and be available to perform restores. In summary, at the main IT location data backs up to the onsite STORServer EBA2802. A disaster recovery copy is then replicated to the STORServer EBA2802 appliance at the secondary site across the river and a tertiary copy is written to tape. This process is 100 percent automated and runs on a customized schedule with no need for daily administrator intervention. Secondary Site: STORServer EBA2802 and IBM TS3200 LTO7 – Located miles away from the primary site, this secondary site contains an identical appliance and library configuration. If for any reason the primary site appliance becomes unavailable, any data restore operations will automatically be performed from this appliance. 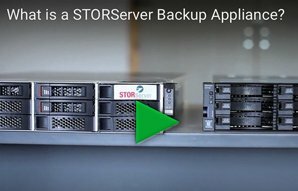 The STORServer EBA2802 appliance’s seamless restore process allows for the data to be accessible to users while the restore job completes in the background. Furthermore, the secondary IBM TS3200 LT07 tape library holds an additional copy of the agency’s data providing a fourth level of protection. In addition to providing the agency with a simpler way to automate the management of IBM Spectrum Protect’s daily administration tasks, STORServer Console delivers a daily customizable report that alerts the agency of any actions needing the attention of an administrator. The intuitive STORServer Console user interface provides real-time monitoring of IBM Spectrum Protect’s sessions, administrators’ activities, scheduled client activity and operator alerts. STORServer provided the onsite implementation, administration training and 24/7 U.S.-based solution support, including diagnostic support for IBM Spectrum Protect software. The STORServer solution specific training, ongoing support and the flexibility to add cloud storage options demonstrate how the agency found a partner in STORServer who will help meet their future data protection needs.